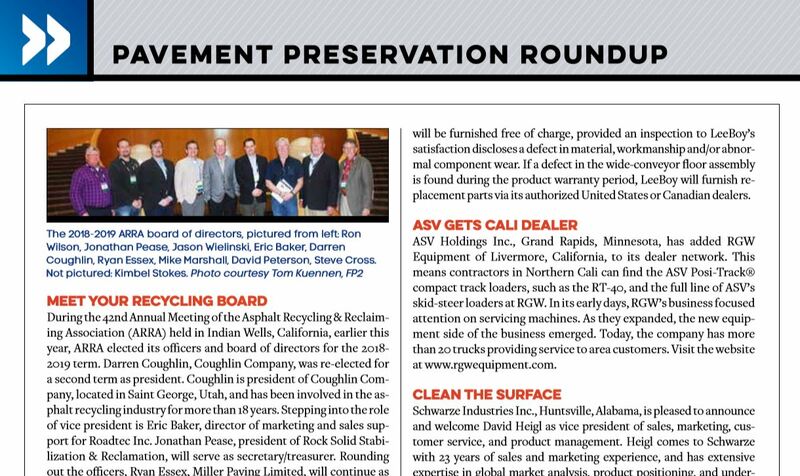 During the 42nd Annual Meeting of the Asphalt Recycling & Reclaiming Association (ARRA) held in Indian Wells, California, earlier this year, ARRA elected its officers and board of directors for the 2018-2019 term. Darren Coughlin, Coughlin Company, was re-elected for a second term as president. Coughlin is president of Coughlin Company, located in Saint George, Utah, and has been involved in the asphalt recycling industry for more than 18 years. Stepping into the role of vice president is Eric Baker, director of marketing and sales support for Roadtec Inc. Jonathan Pease, president of Rock Solid Stabilization & Reclamation, will serve as secretary/treasurer. Rounding out the officers, Ryan Essex, Miller Paving Limited, will continue as past president. Laboratories/Asphalt Materials Inc. Steve Cross, PE, Oklahoma State University, will continue as ARRA’s technical director. During its business meeting, ARRA also revised the association bylaws to allow for up to two more directors to be elected in future years. Schwarze Industries Inc., Huntsville, Alabama, is pleased to announce and welcome David Heigl as vice president of sales, marketing, customer service, and product management. Heigl comes to Schwarze with 23 years of sales and marketing experience, and has extensive expertise in global market analysis, product positioning, and understanding the needs of a customer base. Chicago Pneumatic Power Technique (CP), Rock Hill, South Carolina, has officially transitioned its hydraulic attachments to Epiroc, a productivity partner for the mining, infrastructure and natural resources industries. This transition adds 14 RX breakers, 6 RC compactors and 18 CG grapples to the Epiroc lineup. CP has expanded its core portfolio of air, power and flow products. 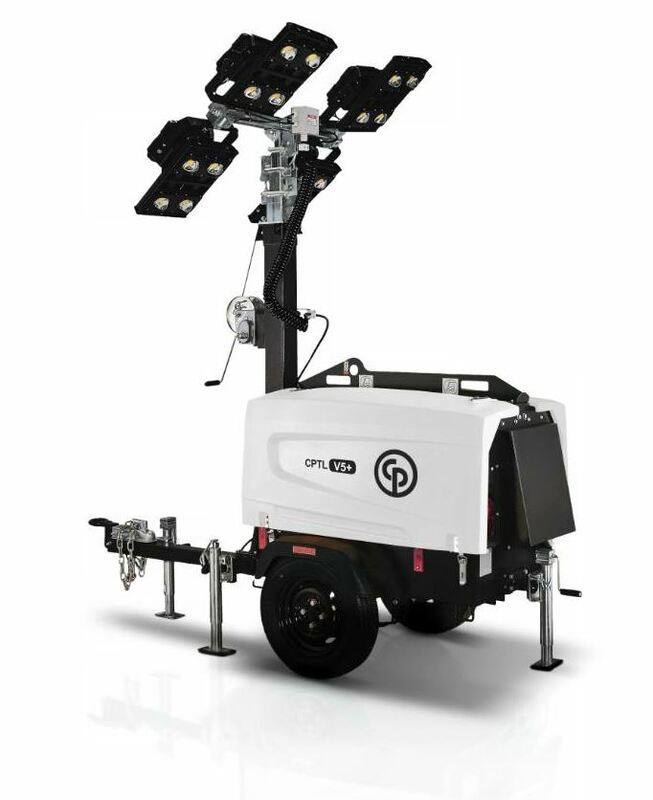 Its lineup includes portable compressors, generators, light towers and pumps, along with dedicated construction products including handheld pneumatic, electric and hydraulic tools. For more information, visit www.cp.com. LeeBoy, Lincolnton, North Carolina, announces its 3,000-hour wide-conveyor floor assembly warranty. LeeBoy warrants for 3,000 hours that the original wide-conveyor floor assembly will be free from manufacturer’s defects and/or deterioration due to normal operation. The warranty is valid to the original purchaser on all LeeBoy wide-conveyor asphalt pavers. The eligible part for replacement is the wide-conveyor floor assembly. The warranty period is activated at the time of serial number registration and expires at 3,000 hours. During the warranty period, the parts for repair or replacement at LeeBoy’s option will be furnished free of charge, provided an inspection to LeeBoy’s satisfaction discloses a defect in material, workmanship and/or abnormal component wear. If a defect in the wide-conveyor floor assembly is found during the product warranty period, LeeBoy will furnish replacement parts via its authorized United States or Canadian dealers. ASV Holdings Inc., Grand Rapids, Minnesota, has added RGW Equipment of Livermore, California, to its dealer network. This means contractors in Northern Cali can find the ASV Posi-Track® compact track loaders, such as the RT-40, and the full line of ASV’s skid-steer loaders at RGW. In its early days, RGW’s business focused attention on servicing machines. As they expanded, the new equipment side of the business emerged. Today, the company has more than 20 trucks providing service to area customers. Visit the website at www.rgwequipment.com.